The motoscafo is the Venetian version of a taxi. Since Venetian avenues are of water, its taxis are, of course, not automobiles. They are boats. However, to simply label a motoscafo as a boat is a gross disservice. To be the passenger of a motoscafo is like being a time traveler, an exotic adventurer, the hero of a romantic novel, or maybe even a movie star. Add your own imagination, your own superlative. One transforms immediately upon stepping down into the rocking craft. The ride in a Venetian taxi is one of the few things in life that surpasses the expectation. It's that good…that exciting. A motoscafo ride is expensive and therefore mostly reserved for the grand entrance into the city, or the sad exit to the airport or train station. It is, thus, almost always accompanied by feelings of operatic emotion. One never feels neutral while in a motoscafo. It is always grand. The pilots of these boats are half the adventure. A small fraternity and almost always men, the motoscafo pilots communicate endlessly with one another as they pass one another during a day's work. They have developed hand signals and short, barking commands that only they understand. It feels like they are all part of the same daily conspiracy—to meet for a drink at a bacaro, most likely. Their boats are jewels of the canals, glistening of polished mahogany and teak. The boats are so lovely that it is a marvel to watch the pilots navigate under the tightest of underpasses. It would be tragic to scratch or damage one. But, the greatest skill of the motoscafo pilot is that of nonchalance. They never fret as they eek their way under bridges or past other boats. They are the coolest of cool. If Sinatra had been Venetian, he would have piloted a motoscafo. "The tide is too high, I must ask you for this huge favor." It was during a very high acqua alta and we had scheduled a water taxi to pick up our friend at the airport. But the tide was so high that the motoscafo could not fit under the bridge of our small canal. And so the pilot had to succumb to the laws of physics and surrender to the waters of the lagoon. We'd have to walk all the way to the Grand Canal in order to meet him. It seemed like a personal defeat for him. The pilots watch the tide tables and know what the tides will be a month in advance. They seem to enjoy cutting it close, to push themselves and their boats to the limit. 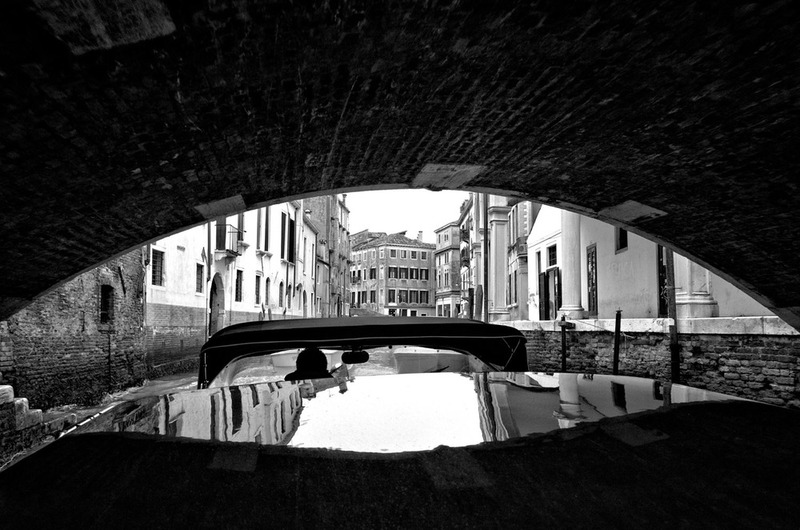 But a boat has a certain dimension and so does each Venetian bridge. And there are scratches on the bridge that show that sometimes the boats don't quite make it. "I must ask you to meet me at the Salute stop of the vaporetto. One could hear the worry in the voice of the pilot. Acqua alta does that to the entire city. Whether you are on foot, in a boat, or behind the counter of a store, the acqua alta is a mess. It tests your limits. It challenges your ingenuity and patience. We walked through the floods in our rubber boots…and met the taxi at the Grand Canal. Mission accomplished. We were on our way back to Venice from the airport and the tide was now on the ebb. The underpasses were emerging from the tide. Our pilot had already done the calculation in his head. We were going to make it under the bridge. "Eek!" I whispered to myself. We were barely slowing. It didn't seem like boat and underpass were going to fit. Undaunted, our pilot kept going…into the underpass…and out! We made it by a whisker and a fine whisker at that. "Bravo!" we shouted forward. Our pilot shrugged in the typical Italian way—as if he'd done it a thousand times before. He probably had.